chloride free fertiliser containing two essential elements for your crops development, providing immediately available potassium and nitrogen. Potassium Nitrate is the most readily available fertiliser form of potassium and nitrogen available. The nitrate nitrogen improves the uptake of potassium into the plant. Potassium Nitrate Prilled is suitable for application via side-dressing equipment or broadcasting. Very little irrigation or rainfall is required to dissolve the prills as it is readily water soluble and it remains in soil solution ready for root adsorption. Timing of applications are suitable at any time during the season, however Potassium Nitrate has a special fit in the later stages of crop development, where the demand for potassium is greatest. General dry spread application rates for horticultural crops are between 50 to 250 kg/ha. 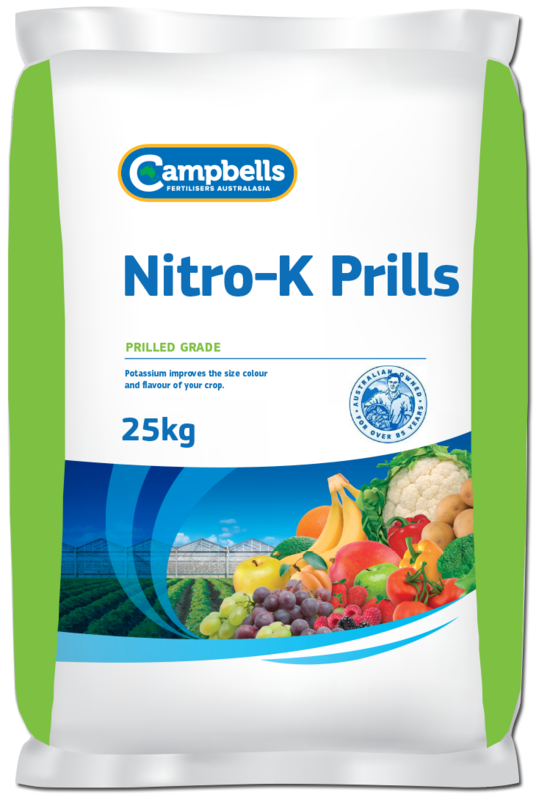 As with any fertiliser program, it is best to seek advice from your Campbells Nitro-K Prills distributor or your local agronomist.